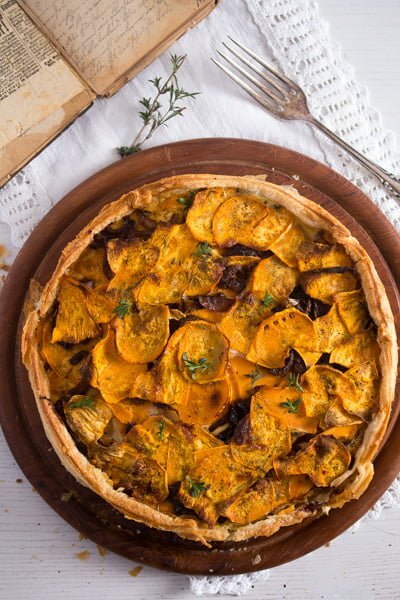 Delicious puff pastry pie with roasted sweet potatoes, caramelized balsamic onions and cheese. 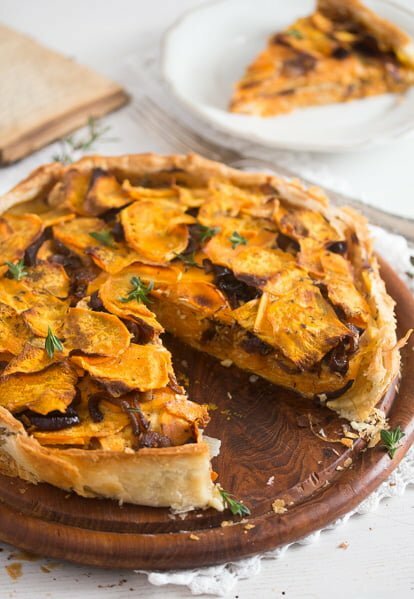 If you like sweet potatoes, you will love this savory puff pastry pie! It makes a perfect vegetarian main dish, one that you can definitely serve either for Thanksgiving or Christmas or any other autumn/winter celebration where you are in need of a main vegetarian main dish (if using the right kind of vegetarian cheese). I was never tempted to make the typical American sweet potato pie. It looks good on pictures, but for some reason or another, I’ve never imagined I could actually enjoy eating it. I might be wrong and I am sure that I would try it, should I ever had the chance to have it cooked by somebody else, but to bake it myself, well it might take a few more years until I am there, I suppose. But when it comes to savory sweet potato pies, this wonderful puff pastry pie with sweet potatoes is not my first nor my last try. 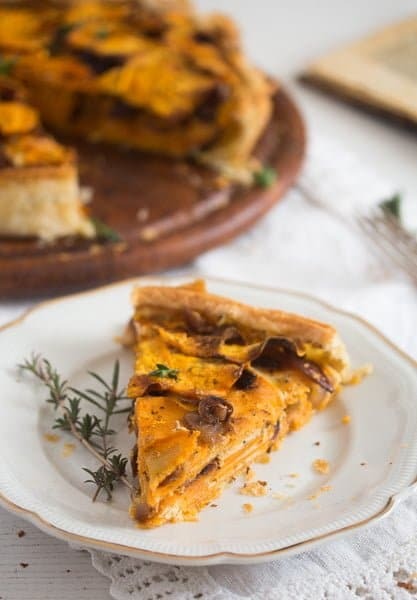 Over the years I have made quite a few sweet potato pies or casseroles, from the super easy sweet potato gratin to vegan sweet potato pie with roasted vegetables, sweet potato pie with Gorgonzola, similar to this one. Or mixed roasted sweet and regular potatoes, pies with a shortcrust pastry and so on. 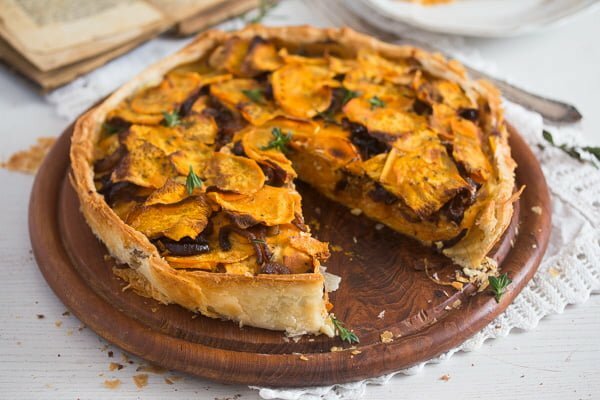 This particular roasted sweet potato pie with balsamic onions is another version of a recipe I found in a German magazine. Whenever we go on holidays with the car, I make a point of buying a recipe magazine at one of the gas stations we stop on the way. It’s like a reminder, every time I look into that magazine over the next few years, I remember during which trip I bought that. It’s nice. I’ve tweaked the recipe here and there to make it more suitable for us, and the main change was adding quite a lot of cheese. It was delicious! 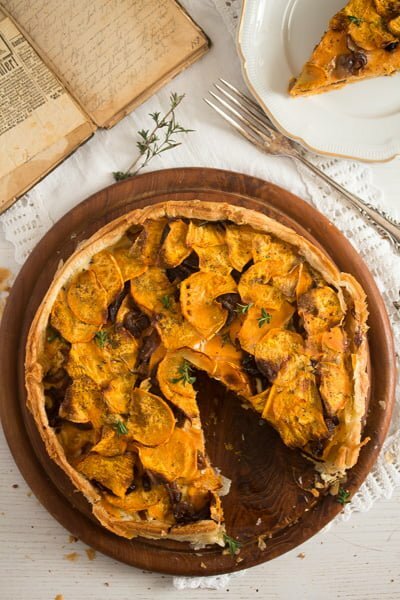 Those soft roasted sweet potatoes, the sweet and tangy balsamic onions and then that oozing cheese, this pie will definitely make you happy. The ingredient list is not particularly long or expensive, all common and cheap ingredients, but the result makes you think that the roasted sweet potato pie is really something elaborate and expensive. It just looks so good! What you will need is some puff pastry. If you want to make it yourself, I am sure it would be wonderful, but I never bother with puff pastry, I like the one I am able to buy, it is delicious and so easy to work with. The most common type of puff pastry in Germany is the one found in the refrigerator section of the supermarket. It is already rolled which makes it even easier to work with. However, if all you can get is frozen puff pastry, that is perfect as well. Just make sure you remember to thaw it in advance and regard the packet’s instruction concerning the way to roll it properly. One sheet of already rolled puff pastry here weighs 275 g/ 9.7 oz. After lining the gratin dish with the pastry, I had some scraps leftover, but not too many of them. So, between 250 g/ 8.8 oz and 275 g/ 9.7 oz will be fine. I used a mixture of white and red onions to make the caramelized balsamic onions, but if you only have one sort of onions, that will be fine as well. I used cream mixed with eggs to pour over the pie, pure cream is fine, half and half is fine as well. I like using Gruyere cheese for this kind of gratins, it is a nicely melting type of Swiss cheese. I love it, not only in this kind of gratins or pies, but also on bread. If you can’t get any Gruyere cheese, you can replace it with another kind of good melting cheese, the one you find or like best. However, if using Gruyere, keep in mind that this particular cheese is not technically vegetarian, as it is made using rennet, an enzyme taken from the stomach of calves. If you want to make this dish vegetarian, make sure you know which kind of melting cheese is suitable for vegetarians. Otherwise, you will need the sweet potatoes, some dried thyme and four eggs. Making this roasted sweet potato pie is much easier than you might think. 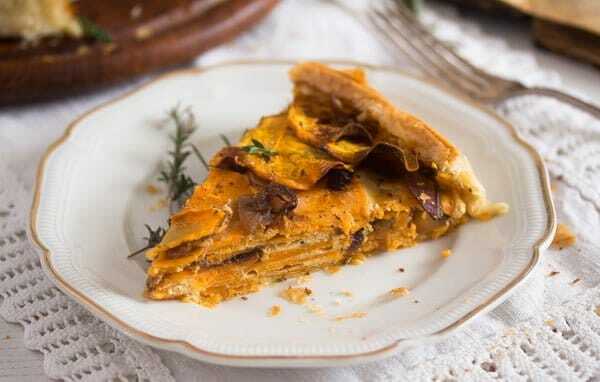 The only thing I think is good to have when making this roasted sweet potato pie or any potato pie or casserole is a mandoline Mandoline Slicer Spiralizer Vegetable Slicer – Veggie Slicer Mandoline Food Slicer with Julienne Grater – V Slicer Mandoline Cutter – Vegetable Cutter Zoodle Maker – Vegetable Spiralizer. A mandoline will help you slice the potatoes or, in this case, sweet potatoes in really thin and regular slices, a job I find very difficult to achieve with just a knife, no matter how good that knife is. So, after a few annoying attempts of slicing potatoes really thinly for a potato gratin, I got myself a mandoline, which I use, 90 % of the times, for this purpose. So, start by slicing the onions. Saute the onions in olive oil, add the balsamic vinegar, sugar and thyme and cook for about 5 minutes more until the onions get soft and start to caramelize. Season and let cool slightly while you prepare the rest. Continue by grating the cheese, then peeling and slicing the sweet potatoes thinly. Line the baking dish with the already rolled puff pastry or roll the pastry yourself. Cut off the excess pastry and pierce the crust with the help of a fork. Arrange some of the sweet potatoes in the baking dish, season them generously, sprinkle with some of the onions and cheese and repeat. End with a third layer of sweet potato slices. Mix together the eggs, cream and milk. Season again and pour the mixture over the sweet potato pie. Bake the pie in the preheated oven for about 50 minutes or until the sweet potatoes are cooked through. If the roasted sweet potato pie with balsamic onions threatens to get too dark too soon, cover it loosely with a piece of aluminum foil, I did that after about 30 minutes cooking time. Enjoy with a green salad with vinaigrette dressing. Peel and slice the onions. Heat the olive oil in a large non-stick pan and saute the onions on medium low heat until translucent and starting to get soft, about 8 minutes. Add the thyme, sugar and balsamic vinegar and continue cooking the onions, stirring often, until the onions start to caramelize and are soft. Take off the heat and let cool slightly while you prepare the rest. 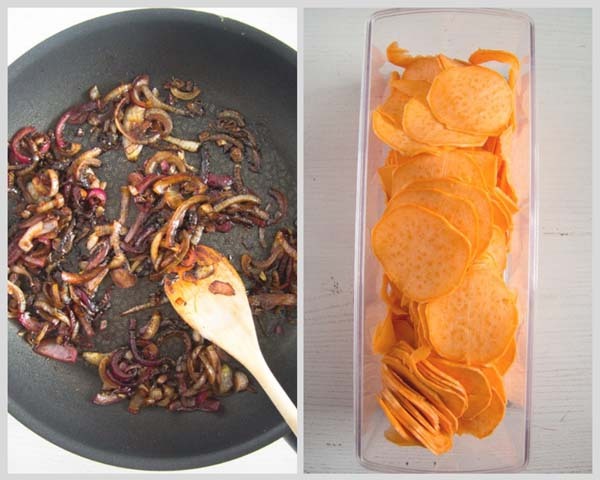 Peel and slice the sweet potatoes into thin slices with the help of a mandoline Mandoline Slicer Spiralizer Vegetable Slicer - Veggie Slicer Mandoline Food Slicer with Julienne Grater - V Slicer Mandoline Cutter - Vegetable Cutter Zoodle Maker - Vegetable Spiralizer.
. Set aside. Grate the cheese and set aside as well. 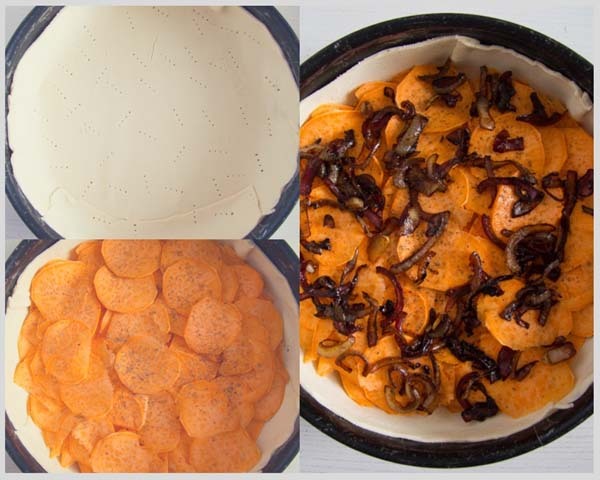 Line a round baking/gratin dish of approximately 26 cm/ 10 inches with the rolled puff pastry. If using frozen puff pastry thaw it and roll it according to the packet's instructions. Pierce the pastry with a fork all over. Divide the sweet potatoes into three even portions. Arrange one portion of the potatoes into the baking dish, sprinkle generously with sea salt and black pepper. Cover with half of the onions and half of the grated cheese. Repeat with the second portions of sweet potatoes and the remaining onions and cheese. End with a layer of sweet potatoes. Whisk together the eggs and cream (or half half). Season well and pour the mixture into the gratin dish. Bake the sweet potato pie for 50 minutes or until the sweet potatoes are cooked through. Loosely cover the pie with aluminum foil after about 30 minutes baking time to prevent the top of the pie to get too dark. Let the pie rest for about 10 minutes and serve with a green salad with vinaigrette. Note 1: I use already rolled puff pastry found in the refrigerator section of the supermarket (in Germany). You can use homemade puff pastry or frozen puff pastry, which should be thawed and rolled according to the packet's instructions. Note 2: Gruyere is a good melting cheese. You can substitute it with another kind of good melting cheese you like. If you want this pie to be vegetarian, make sure to choose a vegetarian kind of cheese. Adina, this looks so delicious! I’m a big fan of sweet potato pie. This savory version looks so good! I bet the balsamic onions add amazing flavor! I could imagine the sweet and savory combo in this pie. I absolutely love anything potatoes, yes..that includes sweet potatoes! 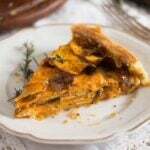 Your savory sweet potato pie sounds very good and certainly would be great to serve during the holiday season. I think it would go especially well with baked ham. This sounds seriously delicious! Sweet potatoes and balsamic onions are a great combo!